One person was taken to the hospital after being shot along Interstate 380 in San Bruno late Sunday, according to the California Highway Patrol. Kris Sanchez reports. 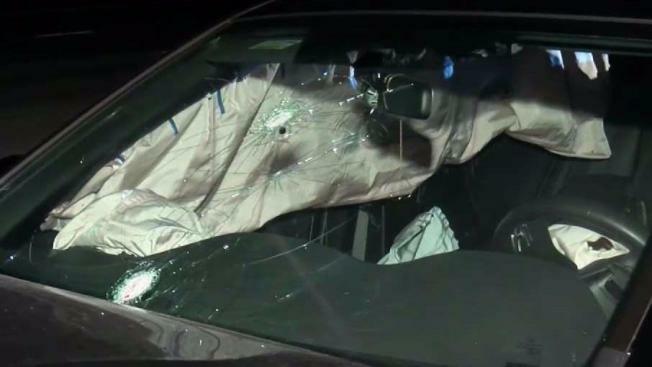 An Uber driver transporting passengers was taken to the hospital after being shot along Interstate 380 in San Bruno late Sunday, according to the California Highway Patrol. The driver, who suffered a gunshot wound to the neck, is expected to survive, according to the CHP. The two passengers were not injured. The shooting occurred around 11 p.m. in the westbound direction near El Camino Real, according to CHP spokesperson Vu Williams. A black Toyota Corolla with an Uber decal on the back window was found next to the center divider "with several what looked to be like bullet holes," Williams said. A second car in the area also appeared to be struck by gunfire, according to Williams. Apparent gun shots damaged the vehicle's windshield and rear view mirror. No suspect information has been released at this time, but an investigation is ongoing, Vu said. Westbound traffic on Highway 380 was shut down for more than four hours, Williams said. Those lanes have since reopened.